Fall is officially happening where I live, in that the leaves are falling off the trees, even though the temperatures are still in the 70s. 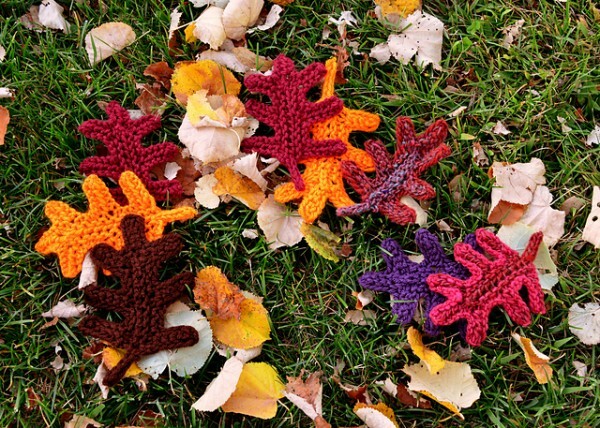 If you’re looking for some fall decor that will last beyond Halloween, check out these super cute Oak Leaves from Xandy Peters. It’s a really interesting pattern because it starts with 101 stitches and end up with 3 stitches at the end for the I-cord stem — and all this action happens in just three rows! It also requires you to do the jaw-dropping knit 5 together, so get out your pointiest needles for this one. The cast on is the longest part of this project by far, and you can knit them up in any color you like. I love the idea of a bunting made with different colored leaves from bits of stash, or they would be great to decorate a table runner for Thanksgiving or to use in lots of other ways. I think I’m going to try this one out and I’ll report back how it goes. I’d love to hear if you try it, too.